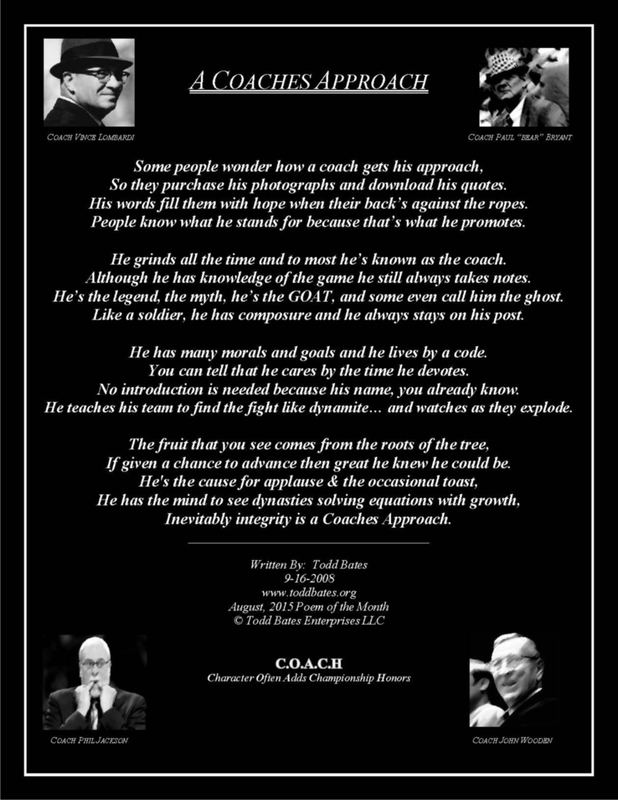 The August, 2015 “Poem of the Month” is “A Coaches Approach”. I pray you have a great month and please keep all coaches, teachers and community leaders lifted up in prayer as the beginning of a new school year is quickly approaching. Have a great month! So they purchase his photographs and download his quotes. His words fill them with hope when their back’s against the ropes. People know what he stands for because that’s what he promotes. 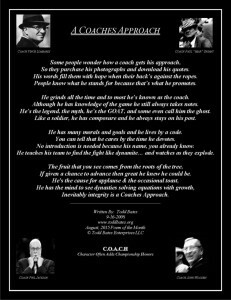 He grinds all the time and to most he’s known as the coach. Although he has knowledge of the game he still always takes notes. He’s the legend, the myth, he’s the GOAT, and some even call him the ghost. Like a soldier, he has composure and he always stays on his post. He has many morals and goals and he lives by a code. You can tell that he cares by the time he devotes. No introduction is needed because his name, you already know. He teaches his team to find the fight like dynamite… and watches as they explode. If given a chance to advance then great he knew he could be. Inevitably integrity is a Coaches Approach.